Warning: This review will contain spoilers. If you haven’t seen the movie, I recommend you save your excitement and come back another day. After years of reading, years of movies and years of unforgettable memories, the franchise has finally come to an end. The second part to the final film has just been released in Australian cinemas before being released in other countries in the world. 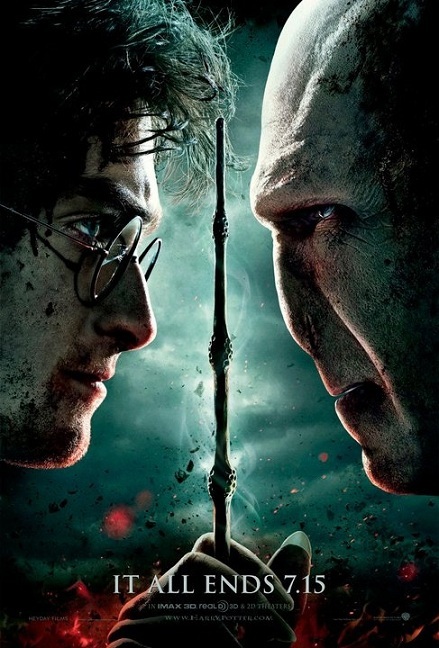 This finale sets up the final clash of Harry and Lord Voldemort and we will see who will conquer in the end, good or evil. The lines were huge and the theater was packed where I was watching. My friend who worked in the cinema said that all the sessions were completely sold out. Luckily for me and my friends, we lined up 2 hours early to get great seat which wouldn’t break our necks.To all those doubting or nervous about whether it’ll be any good, trust me, you won’t be dissapointed. The critics love it, the fans love it and i’m positive it’ll break the one billion mark in the box office. In fact, it hasn’t been released in the US yet and it’s already breaking records. Instead of my usual review, i’m just going to list my favourite parts and the scenes which need more work to be done. Although the movie is instant, action packed and fast paced, the first ten minutes was quite a bore as all they were doing was talking. I understand that it was a vital part of the story but it wasn’t as exciting or fun to watch. The supporting cast had their moment to shine, unfortunately some of those who died weren’t used properly. Lupin and Tonks the prime example. We should’ve at least had a picture or some mention that he had a son. During the Resurrection scene, my friend was just like, “he has a son?” The same can be said with Percy Weasley. Voldemorts epic YUUUAHHHHH scream which is heavily used in the trailer is only in the movie once. Gringotts is so cool! Though I wonder why the Philosophers Stone wasn’t hidden that deep. It was hilarious seeing Hermione acting like Bellatrix. We actually get to see Voldemorts vulnerability and desperation as each Horcrux is destroyed. The movie was much more intense then described in the book. Especially in the scenes where girls started screaming. The Room Of Requirement is most likely the funniest scene with Seamus and Cho having their moment. We also see some of his old classmates. The 30 minutes between Snapes death to Harry’s death was amazing yet extremely heartbreaking and emotional. This 30 minutes was when the whole theatre was silent and where people began to cry. The death of Fred, Lupin and Tonks, Ron crying, Snape crying when he died and for Lily, Harry leaving Ron and Hermione, Harry seeing his parents and Sirius and Lupin and finally, his death. These scenes were brilliant. The whole battle was amazing. 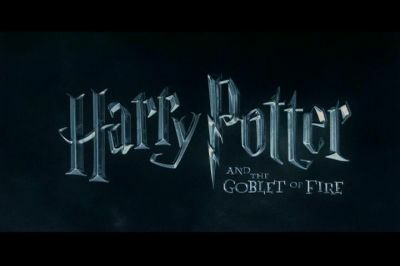 For those who say Harry Potter is a childrens book, they should watch this movie. The supporting characters, particularly McGonnagal, Mrs Weasley and Neville. McGonnagal is a badass! Mrs Weasley releases her inner hero and Neville by far is the star of this movie. Blowing up the bridge, killing the snake and leading the army as well as standing up to Voldemort. No doubt Neville is a true hero and a true Gryffindor. The Malfoys. Draco being a wuss and being saved by Harry. The family leave the battle. Though I do wonder if they were arrested for there involvement with Lord Voldemort. The final showdown between Voldemort and Harry was monumental. All I can say is wow! Voldemorts and Bellatrixs death were intense. Harry breaking and throwing away the elder wand. Great scene to end the battle with. 19 years later. Though the names of the kids are really stupid. Albus Severus? I love how they used the original music in this scene. A great way to end the series. We’ve reached the end of an era and now that it’s over, I don’t know what to do. Of course Harry Potter will always be around to be better than twilight will ever be. After seeing this movie, I can gladly cast a full patronus. To Harry Potter. The greatest story of all time. Come and see the previous Harry Potter posts. 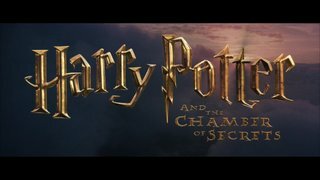 For those first time readers, i’ve decided to relive all the past Harry Potter movies before the last one comes out on the 13th of July, or 15th in the UK and US. Join me this week as we enjoy the final week before the end together. Lord Voldemorts grip on both the wizard world and the muggle world is tightening. 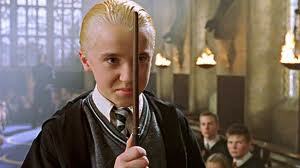 He has chosen Draco Malfoy to carry out a secret mission. Severus Snape makes an unbreakable vow with his mother Narcissa Malfoy to protect Draco and carry out the deed if he were to fail. Harry accompanies Albus Dumbledore to recruit former Potions teacher Horace Slughorn. Dumbledore tells Harry that Slughorns return to Hogwarts is crucial. On the Hogwarts Express, Harry begins to suspect that Draco has become a death eater. He spies on him during the journey to Hogwarts but ends up being caught by Draco who stuns him and covers him with his invisibility cloak. Luna ends up finding him. At Hogwarts, Harry and Ron are accepted into Potions in the last minute and need to borrow the textbook required. The previous owner of Harry’s copy belongs to the “Half Blood Prince”. 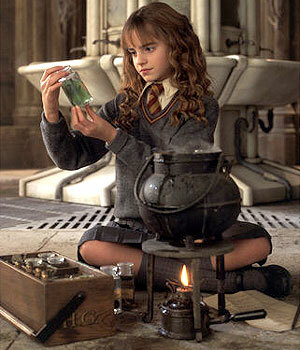 The book has written instructions inside which helps him to succeed in class and win the Felix Felicis potion. During quidditch tryouts, Ron becomes the Gryffindor keeper. As he helps wins their first match, he shares a kiss with Lavender Brown during a party which leaves Hermione heartbroken. When he comforts Hermione, he reveals he has feelings for Ron’s sister Ginny. Harry spends Christmas with the Weasleys where they are ambushed by death eaters Bellatrix Lestrange and Fenrir Greyback who intend to take Harry. Being outnumbered, they decide to escape and burn the burrow as they leave. Back at Hogwarts, Harry begins to suspect that Draco is behind two attempts which aim to hurt Dumbledore, which almost claimed the lives of Katie Bell and Ron Weasley. When Harry confronts him, the two begin to battle where Harry uses a spell “Sectumsempra”, which he saw in his potions book by the Half Blood Prince. Shocked with the curse which begins slicing Draco, Snape walks in and heals a wounded Malfoy. Ginny helps Harry hide the book in the Room Of Requirement where the two share their first kiss. Dumbledore shows a memory from Slughorn which shows vital information on Tom Riddle. However they realise the memory has been tampered. When Harry finally receives the memory, he watches Slughorn tell Tom Riddle about Horcruxes. Horcruxes is dark magic which has the person safeguard a piece of their soul in an object, Voldemort creating seven himself. This grants him immortality, unless the Horcruxes are destroyed. Two of his Horcruxes have already been destroyed, Tom Riddles diary and Marvolo Gaunts ring. After discovering the location of the next Horcrux, they travel to a cave where Harry is forced to have Dumbledore drink the mind-altering potionto retrieve a Horcrux, the locket. A weakened Dumbledore defends them against a horde of inferi and apparates them back to the Astronomy Tower at Hogwarts. Whilst this happens, a group of death eaters including Bellatrix Lestrange, Fenrir Greyback and several other death eaters all enter the castle with the help of Draco. When they arrive at the tower, Harry is ordered to hide. As Draco disarms and tries to kill Dumbledore, he reveals that he was ordered by Lord Voldemort to kill him. Unable to go through with the mission, Snape arrives and kills him with the Avada Kedavra spell. As they leave, they leave the Dark Mark, destroy the Great Hall and set fire to Hagrids hut. 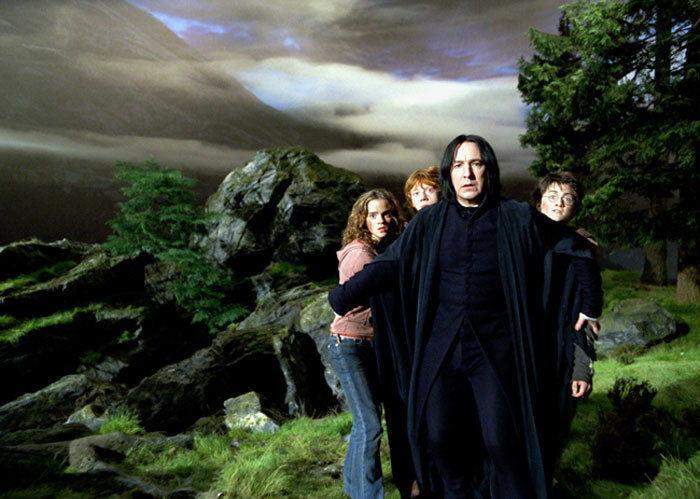 Harry attempts to stop them, but Snape deflects all his spells. He reveals to Harry that he is the half blood prince and escapes. Harry returns and sees the whole school mourning Dumbledores death. They cast away the Dark Mark in honour of his memory. Harry later reveals to Ron and Hermione that the locket Horcrux was a fake. The locket contains a message from an “R.A.B.” to Voldemort stating that he has stolen the real Horcrux with the intent of destroying it. His dying wish is that when Voldemort meets his match he will be mortal once more. Rather than return for their final year at Hogwarts, Harry, Ron and Hermione vow to seek out who R.A.B. was and to find the remaining Horcruxes. The Half Blood Prince was the sixth installment of the series and has made over 900 million dollars in the box office. The movie is much darker and gloomier than it was before. The opening scene instantly has us hooked as the Death Eaters destroy the muggle bridge. Despite a great start, the film begins to lose it’s pace as we listen to the characters go on and on. We also get a lot of comic relief and focus on romance, regarding the gloomy feel and the dark times they are currtently witnessing. The action scenes were well done, I especially enjoyed the last 10 minutes. But the whole movie itself seems to be 2 hours of Harry and Ron finding their first girlfreinds. For non-readers, the movies would’ve been a bore. Despite being among the most praised movies by the fans, I find this movie more disappointing than what it should’ve been. It’s not one I enjoy rewatching and the lines are much less memorable than the others. If it weren’t for the near death situations I would’ve absoloutley despised this movie. Not that i’m into that stuff, I just found the movie quite unenjoyable. The movie focuses on finding out about Voldemort, but it’s that he’s actually not in the movie. Also the guy who plays young Tom Riddle creeps me out. I rank this sixth overall in the franchise. I think i’ve already explained why I don’t think high of this movie. It just ranks above The Chamber Of Secrets due to the stunning effects and scenery as well as the soundtrack. We’ll end with some memorable quotes. Lavender Brown: Ah! See? He senses my presence. Lavender Brown: Don’t worry, Won-Won! I’m here. I’m here. [Hermione takes Ron’s hand. Lavender runs out, sobbing. Awkward silence]Horace Slughorn: What about you, Miss Granger? What do your parents do in the muggle world? Hermione Granger: Ah, my parents are dentists. 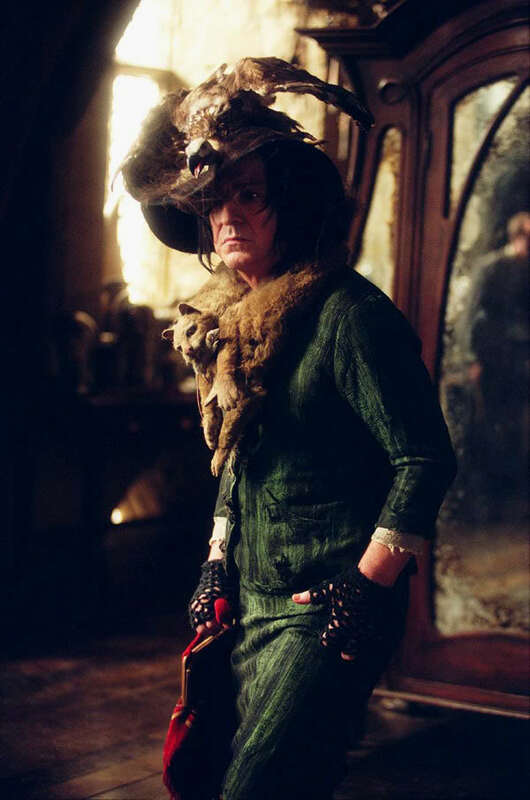 Horace Slughorn: And is that considered a dangerous profession? Luna Lovegood: I’ve never been to this part of the castle. Well, not awake. I sleepwalk, you see. That’s why I wear shoes to bed. Professor Minerva McGonagall: [to Harry, Ron, & Hermione] Why is it, that whenever anything happens, it’s always you three? Ron Weasley: Believe me, Professor. I’ve been asking myself that same question for the past six years.Horace Slughorn: Exactly how did you get out of the castle, Harry? Harry Potter: Through the front door sir. Severus Snape: You dare use my own spells against me, Potter? Yes. I’m the Half Blood Prince. That ends our journey into the Order Of The Pheonix, tomorrow we’ll be reviewing the Half Blood Prince. Follow my twitter account for more posts and stories or subscribe to this blog via RSS and email. Feel free to comment on your Harry Potter memories and opinions and please share this blog with any Harry Potter fans out there. The Minister of Magic assigns Dolores Umbridge to teach Defence Against The Dark Arts who is a senior ministry official and refuses to practically teach students as she is under the impression that Dumbledore is forming a wizard army. As she gains greater control of the school, Harry forms with a group of students to rebel against Umbridge and teaches them defensive and attacking spells, naming themselves Dumbledores Army. Harry has a vision of Voldemorts snake Nagini attacking Mr Weasley. Dumbledore is concerned about Harry’s dream and sends Professer Snape to teach him Occlumency which allows him to block out his mind from Voldemorts influence. After Christmas, several death eaters, including Sirius’s cousin Bellatrix Lestrange. After interogating Harry’s new girlfriend Cho Chang, Umbridge discovers the location and the organistion of Dumbledores army. Dumbledore covers for Harry and escapes before he is arrested. With Dumbledore gone, Dolores becomes the headmaster of Hogwarts. During an exam, Fred and George set off fireworks in the Great Hall, during which Harry has a vision of Voldemort torchering Sirius. He tries to find Sirius by going into Umbridges fireplace but she catches them in the act. Hermione deceives her before Umbridge uses the cruciatus curse on Harry and leads her into the forest where she is kidnapped by centaurs. Harry, Ron, Hermione, Neville, Ginny and Luna all travel to London to rescue Sirius in the Department Of Mysteries. 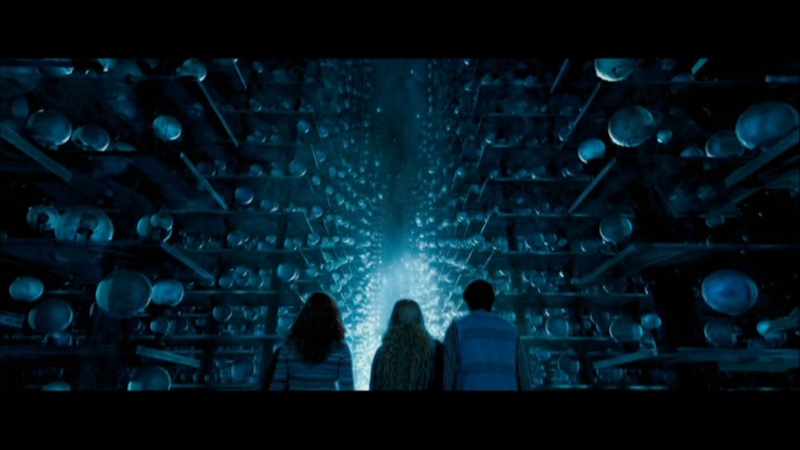 When they arrive in the hall of prophecy, Harry finds that Sirius isn’t there. They find the prophecy which Voldemort is after. They are then ambushed by the death eaters including Bellatrix Lestrange and Lucius Malfoy. Harry eventually hands the prophecy to Lucius Malfoy in return to keeping his friends safe. However the order members including Sirius, Remus, Tonks, Kingsley and Mad Eye arrive and duel the death eaters. Lucius ends up dropping the prophecy and therefore destroying it. 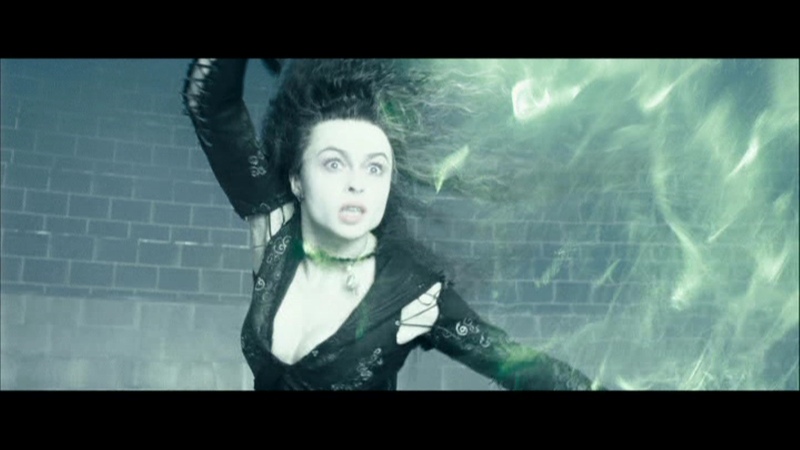 During the battle, Bellatrix kills her cousin Sirius Black. Out of anger, Harry casts the cruciatus curse on her but with little effect. 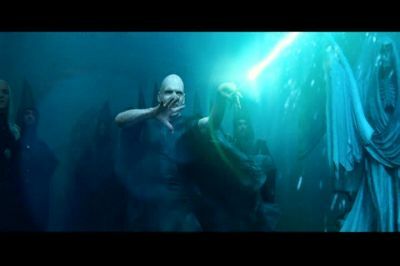 Voldemort appears and so does Dumbledore and this begins an epic battle between the two great wizards. After Dumbledore overpowers him, Voldemort attempts to penetrate Harry’s mind, but Harry repells him with the love he has for his friends and family. The Ministry officials arrive and they see Voldemort just before he escapes. Fudge is forced to admit that Voldemort has returned and then resigns. Dumbledore and Harry are vindicated and Dumbledore is back as Headmaster of Hogwarts. Dumbledore reveals to Harry the meaning of the prophecy, saying he or Voldemort are destined kill the other in the end. The fifth film of the series is the longest book but also the shortest movie. I was dissapointed knowing this as I thought they could’ve included an extra ten or fifteen minutes which would’ve allowed time for other scenes in the book. More should’ve been focused on developing Nevilles character. His story was too brief in the film and really only mentioned. They should’ve at least made a flashback of Bellatrix Lestrange torchering them just like in the first movie with Voldemort and Harry’s parents. Snapes memory was also for me, among the best scenes in the movie, but was way too brief. We didn’t see Lily defending him. One that really ticked off many loyal fans was the absence of quidditch. In my opinion, the film really didn’t need it, though we would have more involvement from Ron if it had been included. I didn’t enjoy the first few minutes in the film. The cornfields made me feel like I was in the wrong movie. I also don’t like how they seem to find themselves in what looks like a New York subway when the dementors attack. The whole scene just didn’t flow. I found the first half of the movie pretty slow for my liking. Harry is also annoyingly whiny in this film. To the positives, one of the things that make a great villain is its actor. Who could forget Imelda Staunton as Dolores Umbridge in this film. Everyone in the theatre despised her and wanted her dead. She was more hated then Voldemort himself. The fireworks scene and the forest scene where she gets kidnapped are among the best scenes of the whole franchise. I also like the additions of Luna Lovegood and Bellatrix Lestrange. Luna seems to be the one that understands Harry the most as she knows what it feels like to be an outcast. Helena Bonham Carter was a great choice for Bellatrix Lestrange, I love her line “I killed Sirius Black” because of the way she said it. The battle scene in the Department Of Mysteries was epic! Though we can expect it to be forgotten after the new movie comes out. This is what I expect from a wizard battle, not Voldemort talking when he had plenty of opportunity and time to kill Harry and talking about killing him. The kiss between Harry and Cho was beautiful and followed by a completely hilarious line by Ron and Hermione. I did feel for her when it was changed to be her fault. I would’ve loved to see the pimples on her friends face. I rank this film fifth overall. It’s quite a low ranking then expected, but it does have some flaws in the movie. As my favourite book, I can’t help but feel dissapointed that it’s the shortest movie. Though I did enjoy the film in general. The actors, the battles, the fireworks, Umbridge and Dumbledores Army is why I enjoy this film. The slow start is what ruins it for me and would most likely put any non Harry Potter fan to sleep. As always, we’ll end with some memorable quotes. Lucius Malfoy: [walking with Bellatrix slowly up to Harry] Haven’t you always wondered what was the reason for the connection between you and the Dark Lord. Why he was unable to kill you when you were just an infant. Don’t you want to know the secret, of your scar. All of the answers are there, Potter, in your hand. All you have to do is give it to me, I can show you everything. Harry Potter: Think I can wait a little longer. NOW! Harry Potter, Ron Weasley, Hermione Granger, Ginny Weasley, Luna Lovegood, Neville Longbottom: STUPEFY! Lord Voldemort: You’re a fool, Harry Potter, and you will lose everything. 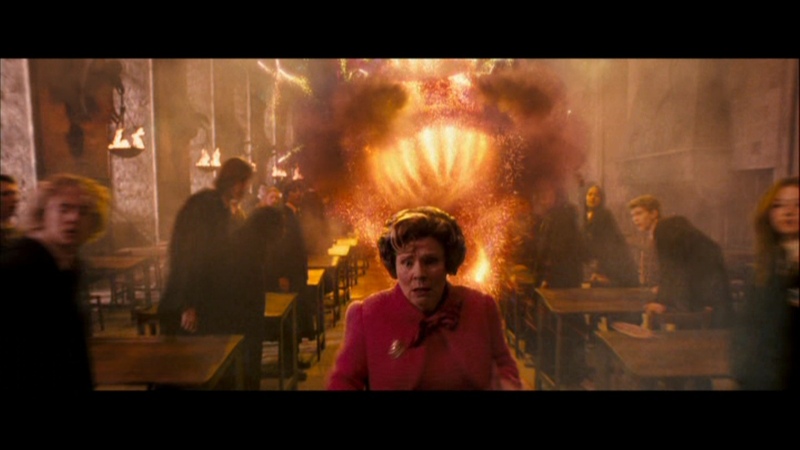 Dolores Umbridge: Please, tell them I mean no harm. Harry Potter: Sorry, Professor, but I must not tell lies.Ron Weasley: [about Harry’s first kiss] Well? How was it? Harry Potter: Wet. I mean, she was sort of crying. Ron Weasley: [laughs] That bad at it, are you? Cornelius Fudge: [referring to Lord Voldemort] He’s back! Kingsley Shacklebolt: You may not like him, Minister, but you can’t deny: Dumbledore’s got style. In the summer, Harry dreams of Lord Voldemmort discussing plans with Peter Pettigrew and Barty Crouch Jr. He then attends the Quidditch World Cup where the followers of Voldemort, known as Death Eaters, have terrorised the spectators after the match. Back at Hogwarts, Dumbledore announces that Hogwarts will host the Triwizard Tournament which will have one wizard from each magical school to participate. 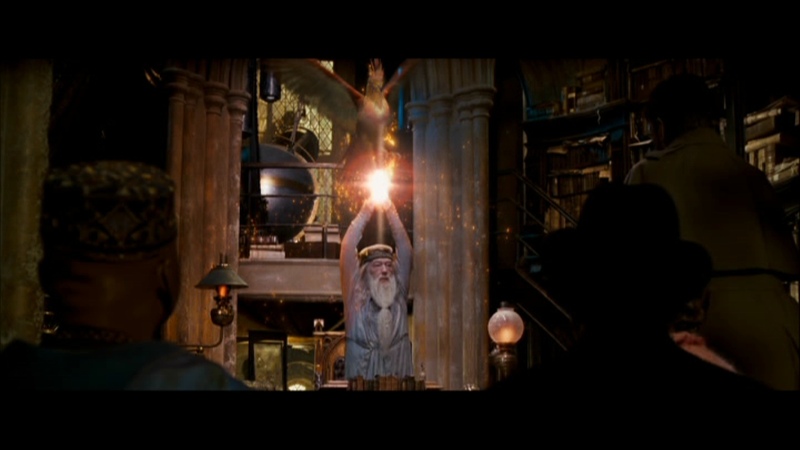 The champions are selected by using the goblet of fire which chooses the most worthy champion. Victor Krum is chosen to represent Durmstrang, Fleur Delacour is chosen to represent Beauxbatons and Cedric Diggory is chosen to represent Hogwarts. Suddenly a fourth champion is chosen unexpectedly which reveals to be Harry Potter. Suspicions grow between the teachers as Harry is underaged and ineligible to compete in the dangerous tournament. In the first Defence Against The Dark Arts class, Moody teaches the three unforgiveable curses. The imperious curse which controls the victim, the cruciatus curse which causes unbearable pain and Avada Kedavra, the killing curse. For the first task, Harry must retrieve the golden egg from the dragon. Taking Mad Eyes advise, he summons his broom to retrieve the egg which gives him a clue to the next task. On Christmas Eve, the students participate in the Yule Ball where Hermione ends up going with Victor Krum which makes Ron jealous. Cedric Diggory reveals to Harry to open the egg underwater, which reveals the next task to be in the Black Lake where they will have to retrieve something precious to the champion. Neville Longbottom helps Harry by providing him with gillyweed which helps him hold his breathe underwater for an hour. During the task, Harry finds out the precious thing that had to be saved was his friend Ron Weasley. He also sees Hermione, Cho Chang and Fleurs sister Gabrielle in suspended animation. Finishing in fourth place, Harry is awarded second for outstanding moral fibre. After an exchange between Mad Eye and Barty Crouch Jr, Harry finds him dead. When called to Dumbledores office, Harry finds a pensieve which allows him to look back at Dumbledores memories. 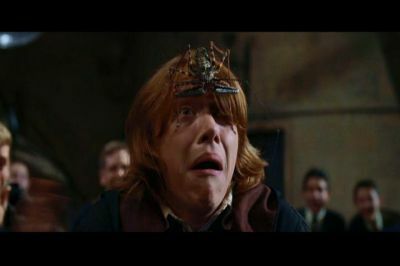 He watches Crouch Sr. disowning his son Barty Crocuh Jr. and sending him to Azkaban for the torture of Nevilles parents. In the third and final task, the champions are placed in a hedge maze were they are required to find the cup first. Under the imperious curse, Victor attacks Fleur and attempts to do the same to Cedric. Harry saves Cedric when he’s trapped in the vines. The two grab the cup which leads them to a graveyard where Pettigrew and Voldemort await Harry. Upon their arrival, Pettigrew kills Cedric, steals blood from Harry, gets the bone of Voldmorts father and slices off his arm to rise Voldemort back again. 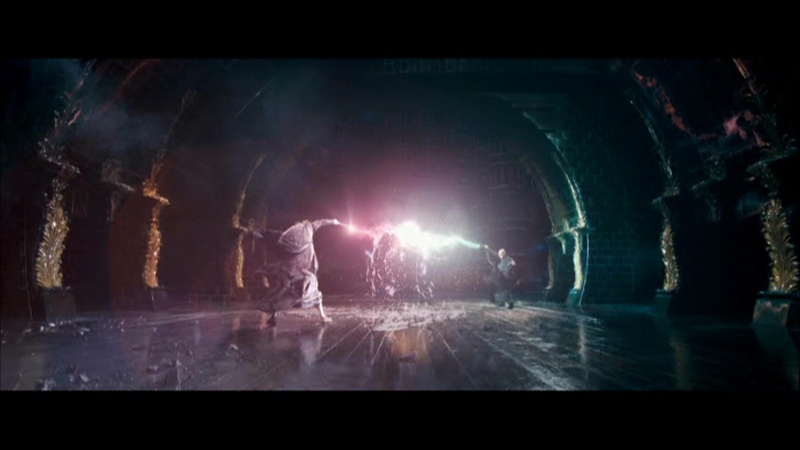 As Voldemort summons the death eaters who then witness the duel between Harry and Voldemort. Harry’s wand forces Voldemort’s to disgorge the spirits of the people Voldemort has most recently murdered, including Harry’s parents and Cedric. Harry is briefly protected by the spirits and escapes with Cedric’s body using the cup. Moody leads Harry back to Hogwarts where his questions lead him suspicious. When Dumbledore, Snape and McGonagall come to rescue him, he discovers that the real Moody is inprisoned in a trunk and that Barty Crouch Jr. was using polyjuice potion to disguise himself as Mad Eye. As the representatives from Durmstrang and Beauxbatons depart, Dumbledore exhorts them to stand together against Voldemort. The fourth film is often regarded by many as the favourite of the franchise. The non stop action and the focus away from school life is what satisfies the fans and reaches it’s potential. This movie is quite frightening with the dark events witnessed in the film. Some memorable moments included the tasks of the Triwizard tournament and the Yule Ball where we get the first indication of Ron’s true feelings for Hermione. Our hearts also broke when Harry was rejected by Cho Chang. Rita Skeeter was also a hilarious addition to this film and I was sad they cut her story out of the film. We also see the characters developing and maturing more in this film. This movie however could do with more involvement of the supporting characters. Maybe scene with Victor and Hermione before the ball, it was a pretty random choice for those watching for the first time. In my opinion, despite some scenes being cut out of the book, the balance is perfect between the movie and the novel. Overall, Goblet Of Fire takes first place in my Harry Potter list. Best movie of the franchise for me. Some memorable quotes from the movie. Professor Moody: Alastor Moody. Ex-Auror, Ministry malcontent, and your new Defense Against the Dark Arts teacher. I am here because Dumbledore asked me. End of story, goodbye, the end! Any questions? Neville: Oh my god! I’ve killed Harry Potter! Harry: [aside] You’re never gonna let him forget this, are you? Voldemort: Don’t you turn your back on me, Harry Potter! I want you to look at me when I kill you! I want to see the light leave your eyes! Malfoy: Why so tense, Potter? My father and I have a bet, you see. See, I don’t think you’re going to last ten minutes in this tournament. He disagrees. He thinks you won’t last five! Harry: I don’t give a damn what your father thinks, Malfoy! He’s vile and cruel, and you’re just pathetic! Hermione: Ronald would like me to tell you that Seamus told him that Dean was told by Parvarti that Hagrid’s looking for you. Harry: Is that right? Well… what? Hermione: Uh… Dean was told by Parvarti… please don’t ask me to say it again. Hagrid’s looking for you. Hermione: I’m not an owl! Rita Skeeter: Harry Potter, aged 12, suspect entrant of the triwizard tournament. His eyes swimming with the ghost of his past. And choking back tears, UGH! 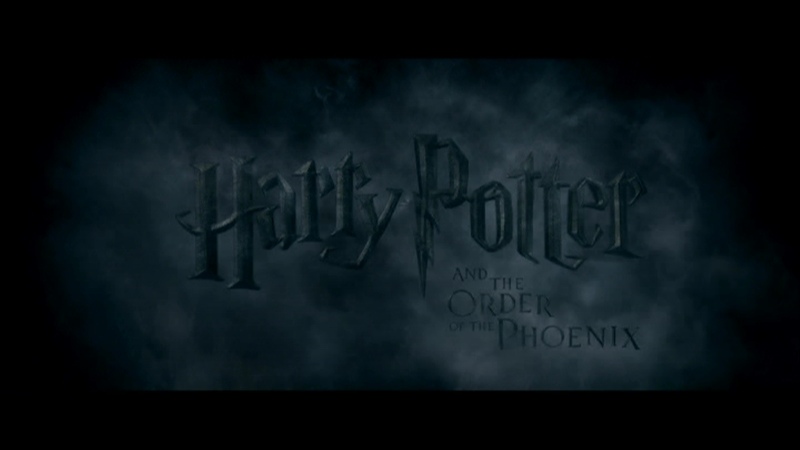 That ends our journey into the Goblet Of Fire, tomorrow we’ll be reviewing the Order OF The Pheonix. Follow my twitter account for more posts and stories or subscribe to this blog via RSS and email. Feel free to comment on your Harry Potter memories and opinions and please share this blog with any Harry Potter fans out there. 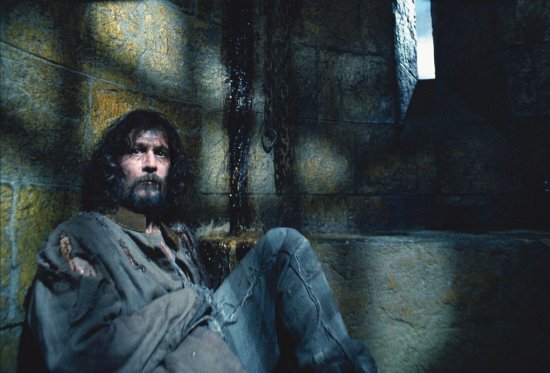 The wizarding world is in fear as mass murderer and supporter of Lord Voldemort, Sirius Black becomes the first man to ever escape Azkaban prison. It’s likely that he’ll be looking for Harry Potter and is intending to kill him. As Harry, Ron and Hermione set off for their third year of Hogwarts, they share a compartment with Defence Against The Dark Arts teacher, Remus Lupin. When the train abruptly stops, the dementors (guards of azkaban) go on the train looking for Black. Harry ends up fainting and reliving his worst memory as one dementor enters their compartment, which Lupin repels with a patronus charm. At Hogwarts, Dumbledore informs the students that the dementors will be guarding Hogwarts whilst Black is on the run. He also announces Hagrid as the new Care Of Magical Creatures teacher. Hagrids first lesson ends with chaos as the Hippogriff Buckbeak attacks Draco Malfoy who was insulting it. His father Lucius Malfoy has Buckbeak sentenced to death. Several dementors interrupt a quidditch match which causes Harry to fall off his broom. Harry goes to Lupin who teaches him the Patronus charm which helps repel the dementors. Harry is banned from going to Hogsmeade visits due to him not having parental consent. Fred and George give him the marauders map which shows everyones location in the castle and all the secret passageways of Hogwarts, one of which leads to Hogsmeade. At Hogsmeade, Harry overhears that Black is in fact his godfather and his parents best friend. He was responsible for revealing the whereabouts of the Potters and murder of their friend Peter Pettigrew. Harry then vows to kill Black. On the day of Buckbeaks execution, Harry, Ron and Hermione decide to console Hagrid before it happens. They escape in the last minute to avoid being seen by the minister of magic Cornelius Fudge as well as Dumbledore and the executioner. The three then witness the execution far away. Scabbers then unexpectedly bites Ron and runs off to the Whomping Willow. A black dog appears and drags him to the passage. Harry and Hermione follow him through a hole which is a secret passageway to the Shrieking Shack. They discover the dog is actually Sirius Black who is an animagus. Harry atcckas Black but Lupin arrives and disarms him. Lupin and Black then embrace as old friends. Lupin then admits to being a werewolf and claims Black is innocent. Professor Snape bursts in, intending to hand over Black to the Dementors, but Harry, having begun to believe Lupin and Black, knocks him out with a spell. Lupin and Black explain that Scabbers is actually Peter Pettigrew, an Animagus who committed the crime for which Black was convicted. Lupin and Black force Pettigrew back into his human form and threaten to kill, however Harry intervenes and opts to send him to the dementors instead. As they head back to the castle, the full moon rises and Professer Lupin begins to transform into a werewolf and Pettigrew manages to escape. Black defends them against Lupin in their animal forms. After Lupin runs away, dementors begin to attack Sirius and Harry. 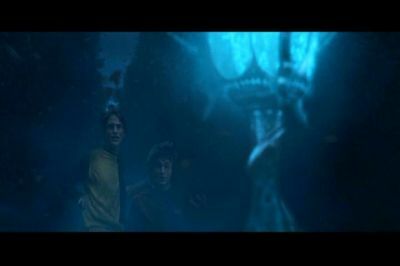 As their souls are about to be removed, Harry sees a distant figure cast a stag shaped patronus which saves the two from a terrible fate. He believes this figure is his father. When Harry wakes up hours later in the Hospital Wing, he finds out Black is about to be executed. Hermione and Harry uses a time turner which brings them back into time 3 hours and watch themselves repeat that nights events. They end up freeing Buckbeak and save Sirius from the werewolf. As they watch the dementors sucking out Black and Harry’s soul, Harry realises it was him who cast the patronus. He runs out to do so. Harry and Hermione then rescue Black and they watch him escape with Buckbeak. Lupin resigns the next day, knowing that parents will object to a werewolf teaching their children. Shortly after, Black sends Harry a Firebolt, the fastest racing broom ever made. Despite Prizoner Of Azkaban being the most critically acclaimed movie, it unfortunately is the lowest grossing film of the franchise, making 700 million dollars. 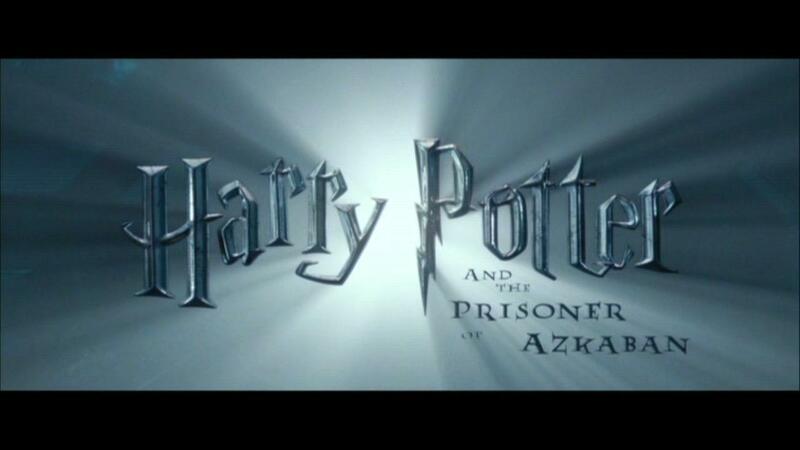 Prizoner Of Azkaban takes us away from the fairytale land of the first two movies and brings a darker and more emotionally satisfying adaption. The ageing of the characters from the previous films and the change to the scenery of Hogwarts has set up for the dark events which await in the future. Also the new additions to the cast has been embraced with the additions of Gary Oldman as Sirus Black, David Thewlis as Remus Lupin and Michael Gambon taking the rold of Albus Dumbledore. JK Rowling admits herself that she put many clues in this movie for clues on the last two books, which were unreleased at the time. This movie is the only one which doesn’t feature Voldemort as a key character in its plot, the villain instead being Sirius Black. Compared with the previous movies, it’s more satisfying as an adventure film and allows us to not only connect with the characters, but to feel apart of the scene as well. I enjoyed the scenes in this movie which was complimented with great dialogue and a fitting soundtrack. This was also the first movie which broke away from the book as some scenes were cut out to or adjusted to fit the storyline. For me, they should’ve included the connection with the map to Remus, Sirius, James and Pettigrew. It also left the unanswered question which Stan Shunpike asked in the beginning of the film, how did Sirius Black escape Azkaban? I rate this movie 3rd overall out of all the movies. This really set up Harry Potter into what it is now. It broke away from being a kids film to being a beloved franchise. I love the new direction they’ve gone and in my opinion, it looks the best visually and has the best soundtrack. Unfortunately it ranks third because their are two other movies which i enjoyed more. We shall end our review of the third film with some memorable quotes. Professor Snape: [taps the blank Marauder’s Map with his wand] Reveal your secrets. Ron: Probably Neville’s forgotten the password again. Neville Longbottom: [behind them] Hey! Professor Lupin: Now repeat after me – without wands please – repeat after me, Riddikulus. Professor Lupin: Very good. A little louder please, and very clearly. Rid-di-kulus. 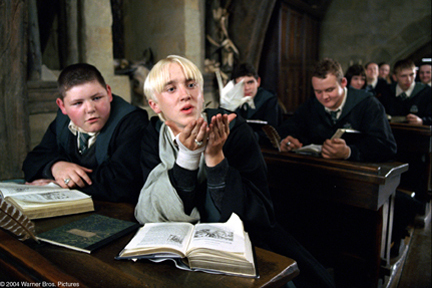 Malfoy: [under his breath] This class is ridiculous. Malfoy: Ah, come to see the show? Hermione: [shouts] You! You foul, loathsome, evil little cockroach! Ron: Hermione, no! He’s not worth it. Vincent Crabbe: Malfoy! Are you okay? Come on, let’s go! Malfoy: [running away] Quick! Not a word to anyone! Understood? 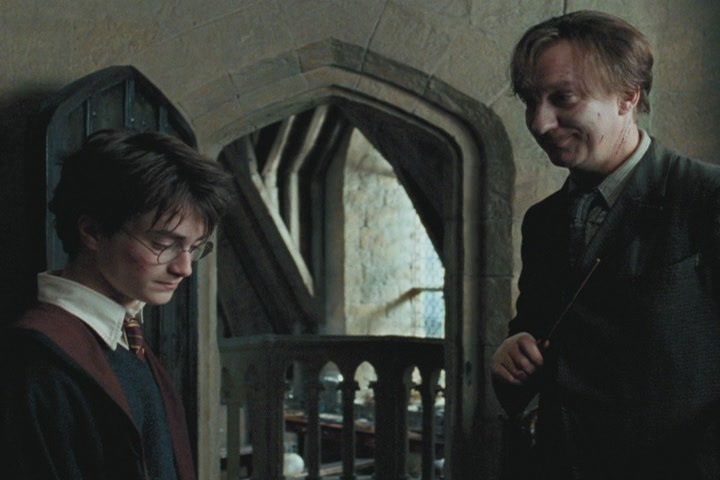 Professor Lupin: The very first time I saw you Harry, I recognized you immediately. Not by your scar, by your eyes. They’re your mother; Lily’s. Yes, I knew her. You mother was there for me at a time when no one else was. Not only was she a singularly gifted witch, she was also an uncommonly kind woman. She had a way of seeing the beauty in others, even, and perhaps most especially, when that person couldn’t see it in themselves. Your father, James, however, had a certain, shall we say, talent for trouble. A talent, rumor has it, he passed onto you. You’re more like them then you know, Harry. In time you’ll come to see just how much. Percy Weasley: I’m Head Boy! That ends our journey into the Prizoner Of Azkaban, tomorrow we’ll be reviewing the Goblet Of Fire. Follow my twitter account for more posts and stories or subscribe to this blog via RSS and email. Feel free to comment on your Harry Potter memories and opinions and please share this blog with any Harry Potter fans out there. Today we’ll be looking back at the second installment of the franchise, The Chamber Of Secrets. During the summer, Harry is banished to his room during an important visit from Uncle Vernons boss. 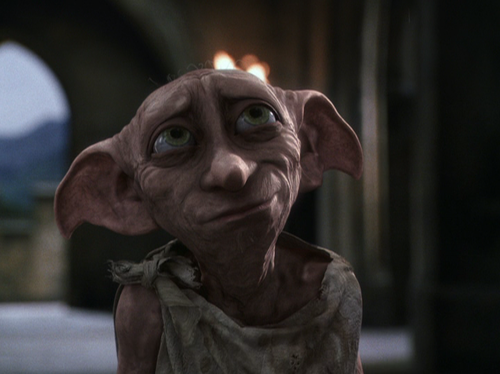 However an unexpected arrival of a house elf named Dobby warns him against attending Hogwarts. When Harry refuses, Dobby gets Harry in trouble by dropping a cake on Uncle Vernons boss which has Harry locked behind bars on his window. When Harry wakes up one night, he finds his friend Ron Weasley who busts him out and bring him to where he lives, known as The Burrow. When Harry and Ron attempt to cross the barrier to Platform 9 and 3 1/4, they find the barrier has sealed itself and are forced to drive the flying car to Hogwarts. However once they arrive, they’re attacked by the Whomping Willow, Ron’s wand breaks and the car drives off into the forest. Shortly after term, Harry begins to hear a curious voice that only he can hear. He follows this voice only to find Filch’s cat Mrs Norris petrified with the words written on the walls in blood “The Chamber Of Secrets has been opened, enemies of the air, beware.” This sends the school in worry as the legendery secret is upon the school. Word has it, The Chamber Of Secrets can only be opened by the heir of Slytherin and is home to a creature only the heir can control which attempts to murder all muggle borns. Harry suspects the heir is Malfoy, however when they brew some polyjuice potion and interrogate Malfoy (as Crabbe and Goyle), they learn that Harry is innocent. During a dueling club formed by Gilderoy Lockhart, Harry finds himself dueling with Draco Malfoy. Malfoy casts a snake upon him but Harry ends up talking to it by speaking in parseltongue (speaking to snakes), which leads to the school suspecting that he is the heir of Slytherin. In the bathroom, Harry finds a book which belongs to a man named Tom Riddle. Tom Riddle ends up showing Harry that Hagrid was the heir of Slytherin. 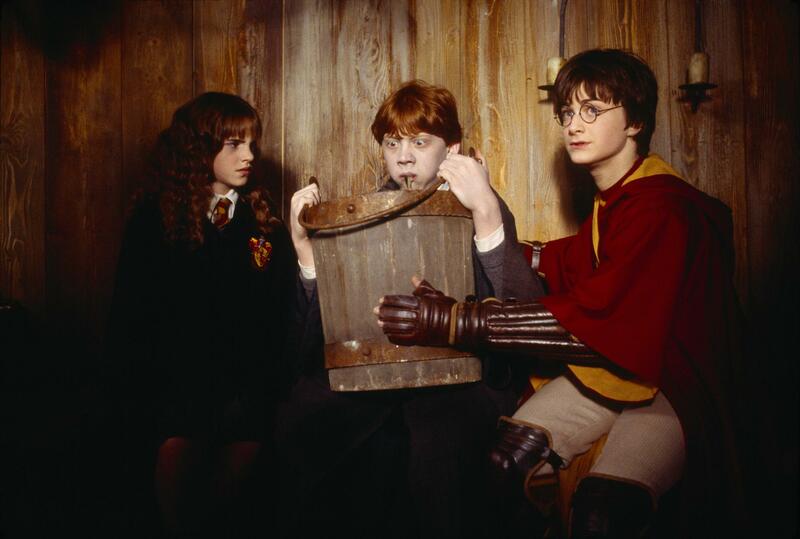 After more kids in the school are found petrified, which includes Hermione, Ron and Harry ask Hagrid about the Chamber Of Secrets, however he is arrested for suspicion of the attacks. They then follow the spiders to a giant spider named Aragog who claims Hagrid is innocent. When they arrive back at Hogwarts, they find out about Ginny Weasley being trapped in the chamber with the message “Her skeleton will lie in the Chamber forever.” They along with Gilderoy Lockhart ask Moaning Myrtle who died 50 years ago about her death, which in turn leads them to the chamber of secrets. Gilderoy Lockhart tries to erase the memories of Harry and Ron but the spell ends up backfiring because of Ron’s broken wand. When Harry arrives in the chamber, he sees Tom Riddle standing by an unconscious Ginny Weasley. Harry then learns that Tom Riddle is in fact Lord Voldemort. Tom then sends the basilisk upon Harry. Fawkes comes to the rescue with the sorting hat which later has the sword of Godric Gryffindor appear to Harry. 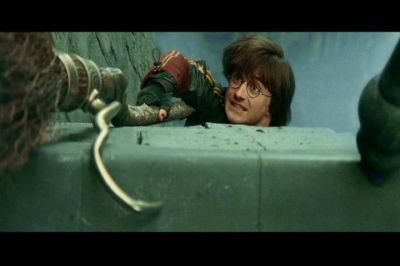 Harry then uses this sword to kill the basilisk. He then gets a basilisk fang and stabs the diary which ends up killing the memory of Tom Riddle. Ginny then wakes up to a wounded Harry, but Fawkes heals him using his tears. The following morning, Harry is told by Dumbledore that only a true Gryffindor would summon the sword out of the hat. He also tricks Lucius Malfoy into freeing Dobby. The story ends with everyone petrified being restored and Hagrid being released from Azkaban prison. The Chamber Of Secrets follows the same faithfulness to the book as the first movie does and maintains a fairytale feel. It contained many scenes of the magical world and at times had too much information which took away from the storyline. This movie does contain some hilarious scenes of the whole series such as pretty much whenever we saw Ron and we also got to see the rival between Harry and Draco Malfoy intensify. Unfortunately it doesn’t seem to rank well with most fans, possibly due to it being dragged for almost three hours and it was likely not as memorable as the other movies. I rank Chamber Of Secrets last in my favourite Harry Potter list. I definitely think it’s underrated, which is pretty ironic, however I find the movie itself feel like a chore to watch. I enjoy it more when watched with other people, but ranks last compared to the other movies. We shall end our review with some memorable quotes. Draco Malfoy: [to Harry, disguised as Goyle] Why are you wearing glasses? Draco Malfoy: Reading? I didn’t know you could read. Harry: Never try to save my life again. Hagrid: What are you doing here? Get outta my house! Lucius Malfoy: You call this a house? Uncle Vernon: And Dudley, you will be? Dudley Dursley: I’ll be waiting to open the door. Uncle Vernon: Excellent. And you? Harry: I’ll be in my bedroom, making no noise and pretending that I don’t exist. Hermione: Look at my face. Ron: Look at your tail. 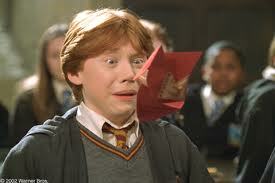 Howler (Mrs. Weasley): RONALD WEASLEY! HOW DARE YOU STEAL THAT CAR! I AM ABSOLUTELY DISGUSTED! YOUR FATHER’S NOW FACING AN INQUIRY AT WORK, AND IT’S ENTIRELY YOUR FAULT! IF YOU PUT ANOTHER *TOE* OUT OF LINE, WE’LL BRING YOU STRAIGHT HOME! Oh and Ginny, dear, congratulations on making Gryffindor. Your father and I are *so* proud. 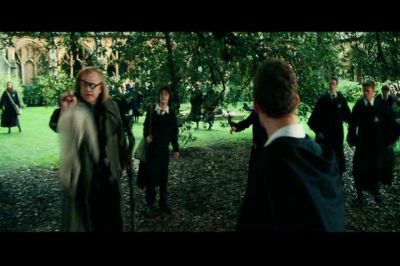 Moaning Myrtle: Here I am, minding my own business, and someone thinks it’s funny to throw a book at me. Ron: But, it can’t hurt if someone throws something at you. I mean, it would just go right through you. Moaning Myrtle: [swooping down towards Ron] Sure! Let’s all throw books at Myrtle, because she can’t feel it! Ten points if you get it through her stomach! Moaning Myrtle: Fifty points if it goes through her head! That ends our journey into the Chamber Of Secrets, tomorrow we’ll be reviewing the Prizoner Of Azkaban. Follow my twitter account for more posts and stories or subscribe to this blog via RSS and email. Feel free to comment on your Harry Potter memories and opinions and please share this blog with any Harry Potter fans out there. Thirteen years ago, JK Rowling released the first of a series of books dedicated to the adventure of Harry Potter. This franchise she created has turned into a global phenomenon from the top of the bestseller list to one of the highest grossing film series of all time. The final week is a sad one for all Harry Potter fanatics worldwide as they await the final end of the adventure they’ve fell in love with for so many years. After the release of the awaited Deathly Hallows Part 2, there will no longer be any new movies for us to enjoy. I remember myself at six years old and obsessed with the idea of magic. I didn’t understand what was happening of course, just the flying of broomsticks, the incantations of spells and the brewing of potions all kept my imagination alive. My first book was in 2002 at eight years old, when my mum gave me the Prizoner Of Azkaban book as a Christmas gift. It was a marathon read as i could only read 3 pages a night at that time. It really wasn’t until I bought the games and the movies when i really became obsessed with the magical world. I then went deeper by reading all the books, stunned and on the edge of my seat as i flipped the pages. This story has been apart of my childhood and now at sixteen years of age, it finally comes to an end. It may bring the same feelings to us fans which Toy Story 3 did to it’s aged audience. With the the film set to release on July 13 in Australia (or July 15 in US or UK), there is just one final week left. Within that week, i’ll be watching the previous movies one by one and and sharing my thoughts to you one by one. I’ll include favourite quotes, funny stories in relation to the film and a bit of my review on each. For all Harry Potter fans out there, join us this week as we count down the days till the end of our beloved wizarding world. Tomorrow we’ll kick off with the Philosophers Stone or Sorcerers Stone if you prefer that name. Follow my twitter account or subscribe to this page for more updates and comment on your thoughts of the franchise.